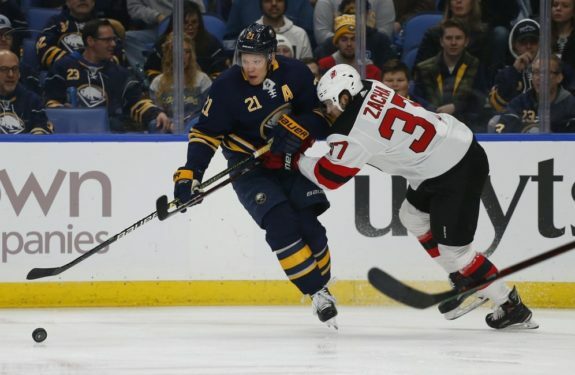 BUFFALO, N.Y. — Jeff Skinner got his 29th goal of the season and the Buffalo Sabres scored five times in the second period on their way to a 5-1 win over the New Jersey Devils on Tuesday night. It was a welcome turn of events for the Sabres, who have struggled with secondary scoring this season. Blake Coleman scored for New Jersey, and Keith Kinkaid made 28 saves. The first came at 1:39 by Skinner. Buffalo’s leading scorer raced down the left wing around defenceman Ben Lovejoy and fired a high shot to the far corner. Minutes later, Smith raced down the right side of the ice and scored his first career goal with a similar strike at 4:14. Kinkaid got a piece of Smith’s shot but it had just enough to trickle over the goal line before defenceman Sami Vatanen attempted to clear the puck away. Mittelstadt made it 3-1 with 9:18 remaining in the second, snapping a 10-game goal drought. After splitting the Devils defence, the 20-year-old’s backhand shot was stopped but his follow-up went in for his sixth goal of the season. McCabe made it 4-1 on a short-handed goal with four minutes left in the period. The defenceman finished a 2-on-1 rush after a patient pass from Evan Rodrigues. Coleman opened the scoring on a deflection 1:28 into the game for his 13th goal. NOTES: Sabres C Jack Eichel missed his third game in a row with an upper-body injury. He returned to practice Monday. … LW Scott Wilson was placed on waivers by the Sabres. Wilson has 14 points (six goals, eight assists) in 49 games this season. … D Mirco Mueller, G Mackenzie Blackwood and D Egor Yakolev were scratched for the Devils. … D Nathan Beaulieu, LW Remi Elie and D Matt Hunwick were scratched by the Sabres.